left to right, Mark Craig (from Dumfries & Galloway), Angus Liston (Musselburgh), Grigor Forbes (Nairn) and Hamish Scott (Loch Lomond) receiving the trophy from Peter Kettlewell, SRUC Agriculture Programme Leader for Edinburgh at AgriScot. 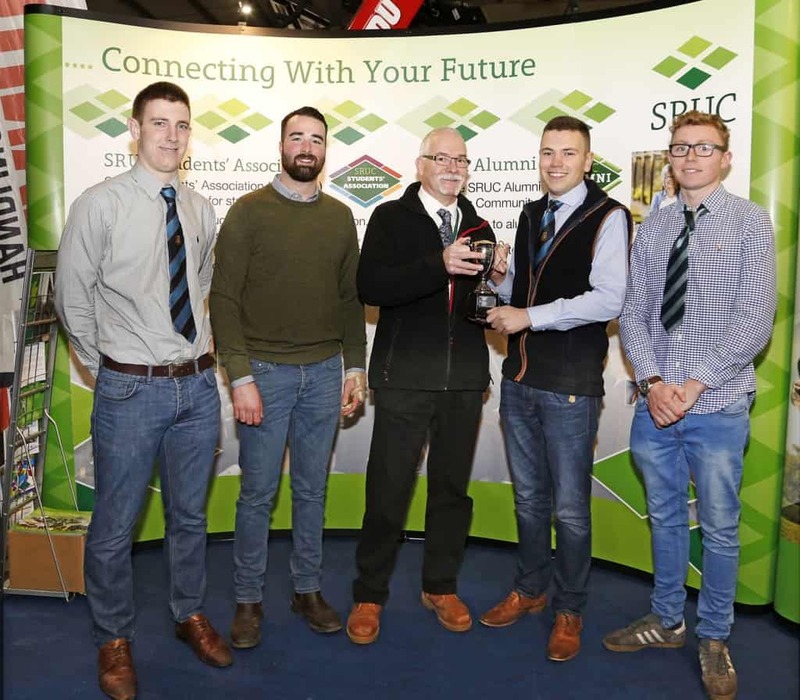 The Winter Wheat Challenge trophy has returned to the Edinburgh campus of Scotland’s Rural College (SRUC). Sponsored by the Mains of Loirston Trust, the winners of the annual competition were announced at this year’s AgriScot, with the King’s Buildings quartet of team captain Grigor Forbes (from Nairn), Mark Craig (Dumfries & Galloway), Angus Liston (Musselburgh) and Hamish Scott (Loch Lomond) taking the honours ahead of 16 other teams. After last year’s trophy was won by a group of students from SRUC’s Craibstone campus in Aberdeen, Grigor and company gained victory by investing in fertiliser inputs to maximise yield. The Winter Wheat Challenge sees teams make management decisions on their own plots, including variety, seed rate, fertiliser and crop protection. The winners are those who make the best return after paying for variable costs. Grigor’s team grew a crop of Savello, Group 4, feed wheat and achieved the highest yields at both the Fife and Edinburgh sites with 10 tonnes per hectare and 9 t/ha respectively. Once crops were harvested, a grain sample from each team was sent to WN Lindsay, which analysed the sample and provided a spot price based on variety and quality. The winners were offered £172 per tonne for their grain which, although not the highest price, was enough to secure victory. Alex Hilton, co-organiser of the competition, said: “A prolonged dry spell coupled with the ‘Beast from the East’ has led to a particularly challenging contest, so huge congratulations go to this year’s winners. The dry season resulted in other teams producing below-average yields, but the winners invested in higher inputs than some, particularly Nitrogen, in order to achieve this. The Mains of Loirston Charitable Trust was set up by the late Alexander Williams Allan, a North East farmer, for “the advancement of education in the fields of either the practice of agriculture or the science of agriculture in Scotland”. Managed by SRUC, the Winter Wheat Challenge is designed to encourage the next generation of farmers and agronomists.